Though not entirely satisfying, Kill the Messenger has enough energy and intrigue to earn its place on a list of movies that rightly give us pause. In yet another electric performance, a terrific Jeremy Renner plays a newspaper reporter who rose and, then, fell with his story. Renner’s portrayal of mayor Carmine Polito in American Hustle was a small classic, and he’s done fine, even scary, work in such tough-minded movies as The Town (2010) and The Hurt Locker (2008). An actor of exceptional edge, Renner creates the impression that his characters could tilt in a hundred different directions. We’re never entirely sure which way they’ll jump. 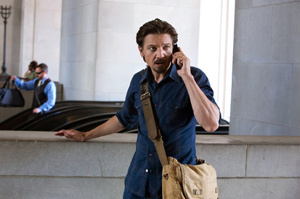 In Kill the Messenger, Renner plays Gary Webb, a reporter for the San Jose Mercury who, in the 1990s, wrote a highly controversial story about Nicaraguan rebels who were smuggling drugs into the U.S. while the CIA apparently looked the other way. Webb’s story started strong and then got blurry: Major journalistic institutions — notably The Washington Post and The Los Angeles Times — tried to poke holes in Webb’s reporting. Even his own paper eventually said Webb had over-reached. As shown in the movie, Webb persisted in his quest because he understood that the story, which tracked events that unfolded during the 1980s, had had devastating, on-the-ground impact: Drugs were being funneled into South Central Los Angeles, where a crack epidemic was ruining lives. If it’s a bit indecisive, pacing and intrigue keep the story humming, as does a large and powerful supporting cast. A seductive Paz Vega plays Coral, a woman who pulls Webb into the story. Tim Blake Nelson portrays an attorney for a crack dealer (Michael Kenneth Williams) who knows the real story of how cocaine is reaching the ghetto, and Barry Pepper appears as a prosector who doesn’t seem devoted to finding the truth. We’re also introduced to Webb’s editors. Mary Elizabeth Winstead plays Webb’s immediate supervisor, and Oliver Platt portrays the paper’s editor. Andy Garcia has a nice, small turn as an imprisoned drug lord who becomes one of Webb’s sources. The movie supplements its main story by showing the toll Webb’s work took on his family, notably on his wife (Rosemarie DeWitt) and the older of his two sons (Lucas Hedges). Unfortunately for Cuesta, this may be a case where the arc of the drama, derived from real events, diminishes its power: Triumph precedes a downward spiral. Webb’s story trades victory for defeat, and winds up knocking the air out of itself. Still, I wouldn’t dismiss Kill the Messenger. We may not always be able to find our moorings in this complicated tale, but two things seem clear: Major institutions — the government and the press — can be tainted by self-interest. And no matter where you look, heroes probably will be in short supply.